THE CARPETING IS AN IMPORTANT PART OF YOUR HOME'S INDOOR AIR QUALITY, THE APPEARANCE INSIDE YOUR HOME, THE COMFORT AND CLIMATE OF THE HOME. MOST DUST, DIRT, AND SPOTS ARE VISIBLE RESTING ON THE SURFACE OF THE CARPET AND ARE EASILY REMOVED USING OUR MILD DETERGENTS AND OUR TRUCK MOUNTED HWE EQUIPMENT. SOMETIMES, THE DIRT OR CONTAMINATIONS CAN GET BELOW THE CARPET FACE YARNS, AND PAST THE PRIMARY AND SECONDARY BACKING OF THE CARPET AND COME TO REST IN THE CARPET PADDING AND THE SUBFLOOR. WINE, VOMIT, PET URINE, AND SODA ARE COMMON SPILLS THAT WILL SOAK THROUGH THE TOP SURFACE OF THE CARPET AND SATURATE THE CARPET PADDING AND THE SUBFLOOR. IN THIS CASE, CAT URINE HAS PENETRATED THE CARPET FACE YARNS, THE CARPETS PRIMARY AND SECONDARY BACKING, AND SATURATED THE SUB-FLOOR OSB PANEL. 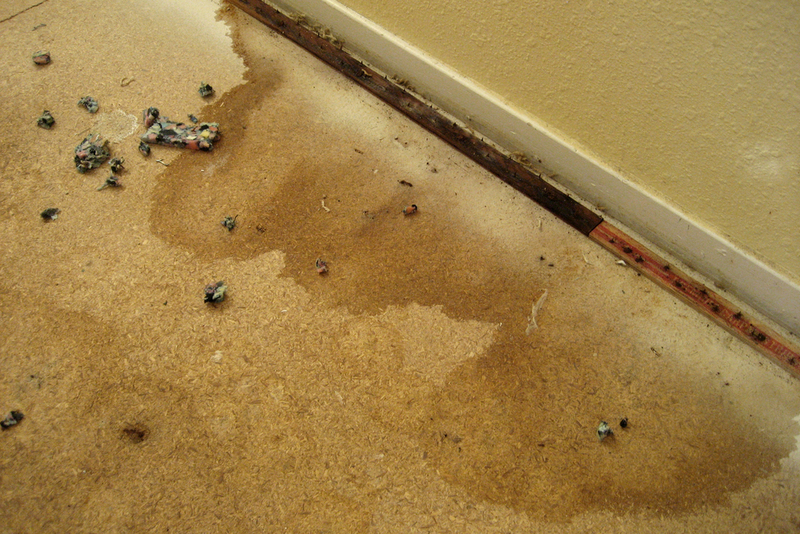 THE TACK STRIP THAT ATTACHES THE CARPET TO THE FLOOR IS CONTAMINATED (IT"S BLACK AND RUSTED) AND WILL NEED TO BE REPLACED AND THE SUB-FLOOR SEALED WITH A LATEX BARRIER BEFORE ANY ATTEMPT IS MADE TO CLEAN AND RE-INSTALL THE CARPET. THE CARPET PADDING WAS SOAKED IN URINE AND MUST BE DISPOSED OF IN THE TRASH AS IT CANNOT BE CLEANED. THREE DIFFERENT RENO AREA CARPET CLEANING COMPANIES WERE PAID TO CLEAN THIS CAT URINE CONTAMINATION PROBLEM UP BUT NEVER LOOKED UNDER THE CARPET TO ADDRESS THIS DAMAGE. THEY JUST CLEANED THE TOP OF THE CARPET AND CONSIDERED IT CLEAN AND FIXED; THE ODOR AND STAINS WOULD RETURN A FEW DAYS AFTER THE CLEANERS HAD FINISHED, DEPARTED THE HOME, AND CONSIDERED THE PROBLEM SOLVED. WE SOLVED THE PROBLEM THE OTHERS MISSED; THE STAINS, ODORS, AND THE RE-OCCURRING ODOR PROBLEMS AND ISSUES WITH JUST ONE VISIT.